Peter’s workshop was a familiar, almost magical place, surprisingly cozy in all its chaos. The smell of wood and dust, mountains of wood shavings curling into beautiful, delicate strips, the tiny planes and other mysterious instruments that are the typical tools of a violin-maker, old violins hanging on strings, the soft light through the windows of the old building: this was the setting for long conversations with friends about life and love and lyrics for potential pop songs, the place of origin of 113 musical instruments now being played all over the world, in concert halls and living rooms, heard on countless recordings. 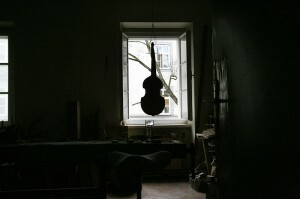 What happens to a workshop, when the instrument-maker is gone? At some point our tax consultant explained to the tax office that the actual value of the workshop consisted in Peter’s special knowledge and skills, and without Peter there was no material – and more pertinently no taxable – value left. It seems a reasonable explanation, but when I had to take pictures of what was left in the workshop and write on the back of each picture what there was to be seen and why it had no more value without Peter, it was one of the hardest things I had to do. I had to be careful not to smudge the writing with my tears. Perhaps, if the workshop had not been such an essential part of my life too, if it were not attached to my office, where I work, where I feel safe and content, perhaps then I could have let it go. Perhaps. As it is, though, the thought of giving up those two rooms to some random person, who might come in and occupy that space, take it over, that thought was unbearable. Instead, I decided to take over the whole of the rent contract myself and try to turn the space into a different kind of workshop. The front room, which had been Peter’s “office” (although it looked more like a jumbled attic room), which had been my home before that, before I met Peter, where he moved in with me after we met and decided to get married, has now been turned into a comfortable room with couches and chairs that can serve as beds, with a small tea kitchen with a cupboard from 1960, which belonged to Peter’s parents when they were married, and a desk for Seth, who is now officially employed as my assistant since August. 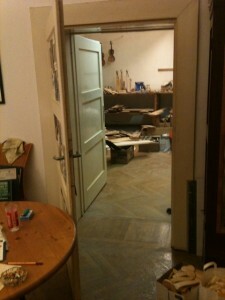 The large room, the workshop itself, is now empty, completely empty. The walls have been newly painted, the windows cleaned, and friends are building a system of tables for me, which can be flexibly arranged and easily stowed away when not needed. The plan is to offer this space to artists, especially young artists from the independent art scene in Linz, who just need a large empty room to realize their ideas. I have received tremendous encouragement for this plan from so many people, and there seems to be much interest in using the workshop. Financially, it is something of a stretch at this point, but I am convinced it is worth the effort. The “new” workshop, which we have decided to simply call “Werkstatt am Hauptplatz/Workshop in the Main Square”, will formally open on 22 November, the first anniversary of the memorial service for Peter, with a small photo exhibition to mark the transition. Two photographers, Reinhard Winkler and Gerald Ehmann, took pictures in the workshop at different times and from their respectively different perspectives. Both of them have generously offered to make all of their photos available, a group of young artists from the art university will select and hang about thirty of them in the workshop, where they will stay until 1 December, and then the photos will be left for people to take, to keep as a reminder of Peter and what the workshop was. The process of transformation required to make this plan feasible has been long and painful. 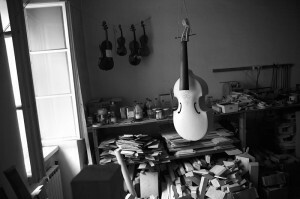 It would not have been possible at all without the incredibly generous effort of so many people, starting with the violin-makers from Linz, Alexander Schütz, Franz Übelhör, and Ingrid Wilske, the harpsichord-maker Martin Pühringer, and Momo Pesendorfer, whose familiarity with Peter’s office was invaluable. That Paddy met Agnes and thus brought into our lives the delightful daughter of another violin-maker, Gabor Kilyenfalvi, almost the first violin-maker that Peter made contact with, when he returned to Austria after training in Scotland, was a most surprising coincidence, but so fortuitous that it seemed almost like a good omen. I was just happy to hear Gabor’s voice again, and coming around in a full circle to Gabor seemed somehow very comforting. Bit by bit, tools, shelves, wood, random objects, mountains of paper and all the rubbish left over began vanishing from the workshop. In March the door between my office and Peter’s workshop, which I had used for years simply as a closet, was opened again for the first time in about twenty-six years. I got stuck for a bit then, but in June the amazing “chaos-tamers” came, and the space began to take on its new form – not by itself, but due especially to Seth’s hard work and Azra, the wonderful young woman that he has brought into my life now, with all her energy and determination and a sense of detail. Instead of old objects being carried out, new objects were carried in, and Peter’s old office became a comfortable, welcoming place. Being able to look forward to the new life and creativity that will hopefully fill this space is one of the things that keeps me going. Taking something apart in order to make room for something new is more motivating and encouraging than solely taking something apart that was so familiar, so important, so beloved. What this means, however, was quite drastically brought home to me a few days ago. Since the climbers were all too wet and cold to stay and share a glass of whiskey in memory of Peter two weeks ago, when the memorial plaque was placed in the mountains for him, the group met again last Thursday in the Alte Welt, and I invited them all upstairs to share the whiskey afterward. Perhaps it was stupid or just short-sighted of me, but having lived for nearly a year now with the process of transforming the workshop, I was not prepared for the effect that the empty room would have on so many people, who all had such fond memories of spending time there with Peter in his workshop. Seeing everyone in tears, I felt distressed, almost guilty about what I had done. Where do you draw the line between closing a life that has ended and erasing the traces of someone who has gone? What does each person need to hold onto, in order to be able to cope with loss? How much change is necessary to be able to gone on living, how much is too much and makes the loss even more painful? Finding the right balance for myself is often so hard, but I feel I also have a responsibility to others, especially Peter’s parents and sister, our sons, close friends – I am responsible for closing Peter’s life, but I am certainly not the only person who has lost him. The first anniversary of Peter’s death is approaching now on 13 November. I know we all need to do something to mark that date, but at this point I have no idea what. I am, however, deeply grateful to have the photo exhibition to look forward to on 22 November, a chance to look back at what was – and to go on from there. Ich hab den Blog gerade gelesen. Hat mich auch sehr berührt, obwohl ich in diesen Räumen nie war, da ich Peter ja über Matthias, und dann eigentlich nur mehr über s Bergsteigen traf. Finde die Idee, wie der Raum weiter genützt werden kann / darf / soll sehr schön! Ich wünsche dir einen schönen „Neustart“ mit dieser Idee, diesem „Projekt“. Everyone has the right, and the need, to cry. Doing it together must be a very moving and uniting experience. And there was the moment of realisation…the emptiness, the loss. You can’t hold on, the physical part has to go and be mourned. Wonderful, what you did.